some readers of the mouse have asked for photos from new york! well you've got it! if there is any truth in the saying that a picture is worth a thousand words, this is one wordy post! simon and garfunkel's the 59th street bridge song (1966) here is a song that captures the feel of new york and the arrival of spring! Heh, heh! The song certainly fits the day. Although we're only getting into the low 40s with a bit of a breeze today. And Fort Tyron's crocuses are getting dusted with snow as I type. But I'm out the door in search of Vernal Equinox material, no matter what! Happy First DAy of Spring, Kim! I love your photos. I'm rushing out the door with L but I'll be back to see the slide shows. groooovy slideshows. *almost* as good as being there. Merci! Have a great first Spring day! I'm glad you found blooming crocuses. (croci?) I went to Central Park yesterday evening hoping to see some, but they were all still buds. 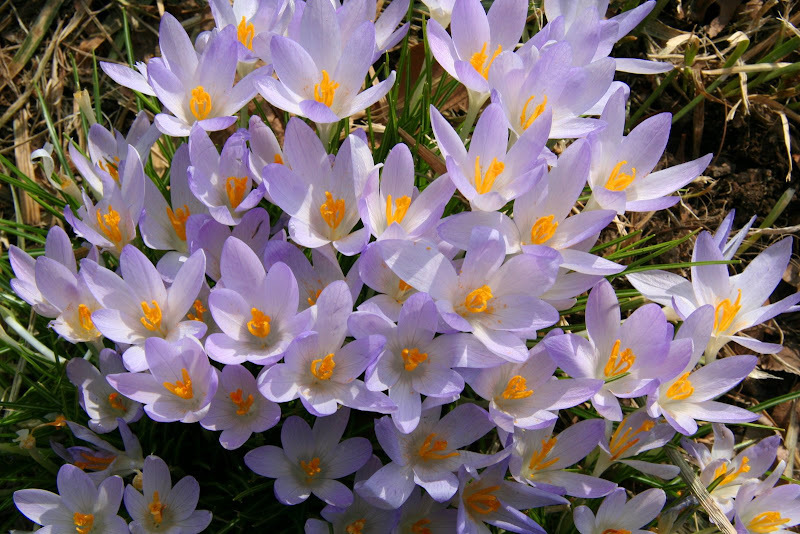 Beautiful crocuses! The Spring theme is blooming in blogdom! Hello lamppost what cha knowin'? Perfect song and springy post! wow! this is a picture perfect scene of spring. lovely! Dennis loves you--what no drunken party pix? So many pictures, so little time! I'll be back! This will be a nice post to dip into throughout the weekend! Great photos. So many, I haven't looked at them all yet. But the shadow pattern from that fire escape kinda flipped out my brain. Thank you for the lovely trip to NYC. I am a Calif girl who has never been. Now if feel somewhat like I have. Happy Spring. Perfect song for a perfect image. Happy Happy Spring! Okay, only had time for slide show 4 but it is well worth it. Have to come back for the rest. I haven't heard that lovely song for ages - thanks! roy - snow in fort tyron! they have been calling for dusting here too, but so far, knock on wood it hasn't materialized. rlb - thanks... though nothing can beat the real deal!! I (heart) ny!! steve - I didn't see any flower activity in central park either...but did see crocuses in little beds on the south side of some buildings in various locations when we were wandering about... fort tyron's heather was very lovely too! cinnamon - nice that so many bloggers mark the arrival of spring (or autumn) - kind of disputes the notion that cyberspace removes people from nature??? flawsnall - are the wildflowers blooming in texas these days?? reyjr - hope you enjoy your seasons as much as I enjoy ours! dd - you are welcome! bon printemps! Ah yes Spring! The sounds of the birdies chirping( when not drowned out by the motour-bikes ). Watching the geese fly NORTH. The sunshine. And...it's 25 bloomin' degrees, outside! Such is Spring-time in New England. This post warms one up tho' :) Happy week-end! This is a call to everyone to please step outside the right vs. left paradigm. While there are important issues worth debating within this paradigm, all of them will be moot if we do not focus on a much greater issue outside this paradigm. Thomas Jefferson warned of wealth concentrating to such an extent that it threatened the state. Nowadays the media has taught us all very well to ridicule anyone who talks of central banks usurping the power of government. Well now I suppose the media will have to laugh at themselves, as many outlets from Newsweek to the Financial Times of London are openly discussing the creation of a "bank of the world" that will control economic policies of every nation. I invite you to watch this video, which details how this is currently taking place. While it focuses on our current officials' cooperation with these plans, it steps out of the typical political paradigm by highlighting the cooperation of both parties. Please do not look to politicians to protect us. Only we can protect us. And our first step must be to reach out to police and military. Without their cooperation, the global elite won't have the muscle to exercise their will of oppression. Please share this oath keepers blog with them. Those slide shows brought back lots of very happy memories of when Lettuce & I visited the city last spring. And I remember a certain someone showing us the bridge in the song too! I heart NYC, too! Loved the photos at the Met. Thanks for the tour. What a gorgeous tour of the city that always tugs at my heart (along with Barcelona, Paris, Buenos Aires...). I love some of the people caught off guard but still giving a sly smile. I think we see things through similar eyes sometimes and see the glory in even in the mundane. Though little is mundane in Manhattan, but even with it is, it leave me 'feeling groovy'.